This is how Nigeria is leading in Unity of the Faith and Mankind in the New World Order for Human and Universal Transformation. Nigeria leads, We Lead. IT IS GOODNEWS! GOODNEWS!! GOODNEWS!!! 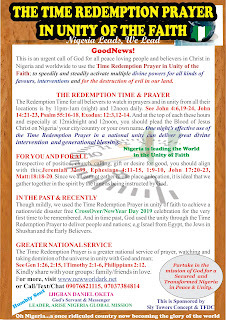 It is an urgent call of God for all peace loving people and believers in Christ in Nigeria and worldwide to use the Time Redemption Prayer in Unity of the Faith; to speedily and steadily activate multiple divine powers for all kinds of favours, interventions and for the destruction of evil in our land. The Redemption Time for all believers to watch in prayers and in unity from all their locations is by 11pm-1am (night) and 12noon daily. See John 4:6,19-24, John 14:21-23, Psalm 55:16-18, Exodus: 12:3,12-14. And at the top of each these hours and especially at 12midnight and 12noon, you should plead the Blood of Jesus Christ on Nigeria/ your city/country or your own name. One night’s effective use of the Time Redemption Prayer in a national unity can deliver great divine intervention and generational blessing. Irrespective of position, church, calling, gift or desire for good, you should align with this; Jeremiah 32:39, Ephesians 4:11-15, 1:9-10, John 17:20-23, Matt:18:18-20. Since we all cannot gather in one place or location, it is ideal that we gather together in the spirit by the time as being instructed by God. 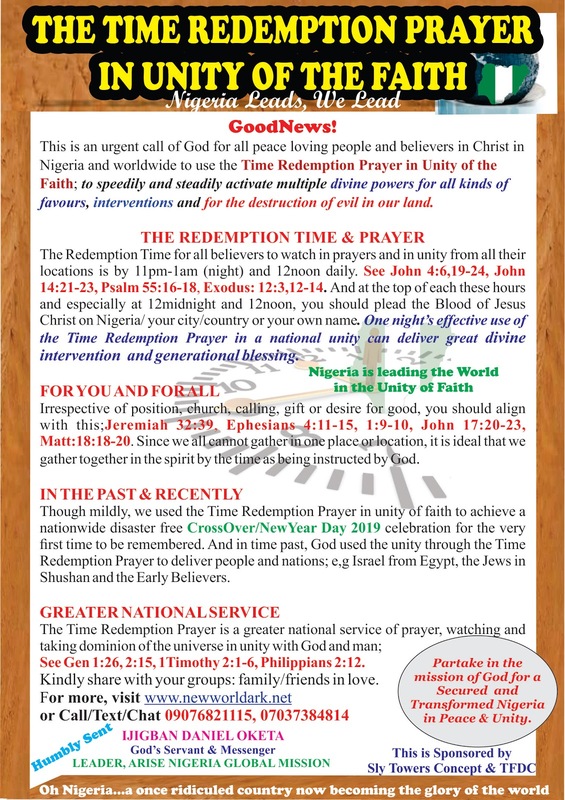 Though mildly, we used the Time Redemption Prayer in unity of faith to achieve a nationwide disaster free CrossOver/NewYear Day 2019 celebration for the very first time to be remembered. And in time past, God used the unity through the Time Redemption Prayer to deliver people and nations; e,g Israel from Egypt, the Jews in Shushan and the Early Believers. See Gen 1:26, 2:15, 1Timothy 2:1-6, Philippians 2:12. Every effective creation is partnership and this time, the effective partnership with God and with mankind, believers themselves through which nothing is impossible. See this and be greatly inspired by God to move on and make more exploit in the united diversity. Nigeria is leading in unity of the Faith. A country once greatly ridiculed is now becoming the glory of the world. Kindly share with your groups: family/friends in love.